CUSCO, Peru – Let me tell you about Monica. But first, have some tissues handy. You may need them. I sure did. I still do as I write this several days later. Monica comes from Arequipa, a major city in southern Peru. As a little girl many years ago, she was asked how many children she’d like someday. Monica recalls laughing and responding, “I’d rather have 10 dogs than any children.” Most people thought it strange. She didn’t care. Later, as an adult, Monica embarked on a banking career. One day, she was asked to visit a customer. Near that person’s house, she went to toss some trash in a public receptacle and made a horrifying discovery. Monica speaks no English, so she revisits the scarring memory with me in Spanish, with the help of Layla, a fellow native Peruvian and animal lover who has accompanied me. The ensuing medical examination revealed even more appalling evidence of what transpired. According to the veterinarian, the dog had been raped. Several times. By several different men. Then tossed in the trash to die. And she would have, were it not for Monica’s divinely timed intervention. That was eight years ago. The event left Monica understandably shaken, but also resolute. She always loved animals, and this tragedy inspired her to help other needy animals in a country where too few people share her passion. 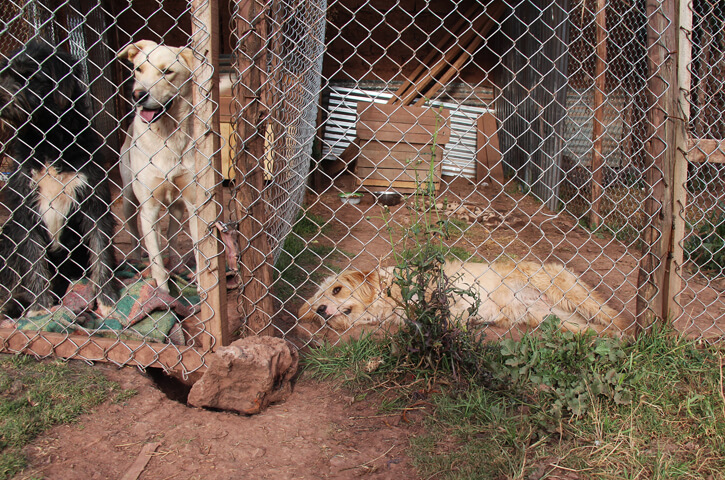 Monica Chacon’s current Pataz shelter in Cusco, Peru is surrounded by the Andes Mountains and neighbors who are not sympathetic to her animal welfare activities. Immediately, she set about starting a charity, which she named Pataz – Spanish for “Paws.” Initially, her mother questioned the idea, but her father understood completely. For years, going back to when Monica was a child herself, her “papa” would secretly feed the many stray dogs in their neighborhood. “I never knew until he told me that day,” she smiles. Eventually, Monica also moved to Cusco, a vibrant modern city best known as the ancient capital of the Inca Empire, high in the Peruvian Andes. Today, the woman who once dreamt of having 10 dogs now cares for more than three times that number, both at the Pataz shelter and in her own home. However, the future of Pataz and the many animals in Monica’s care hang by a fraying thread. For starters, there’s the location issue. Over Pataz’s first two years, Monica ran the organization out of her home, where she gave shelter, love, and comfort to numerous homeless dogs. It quickly became clear, though, that Monica needed more room. 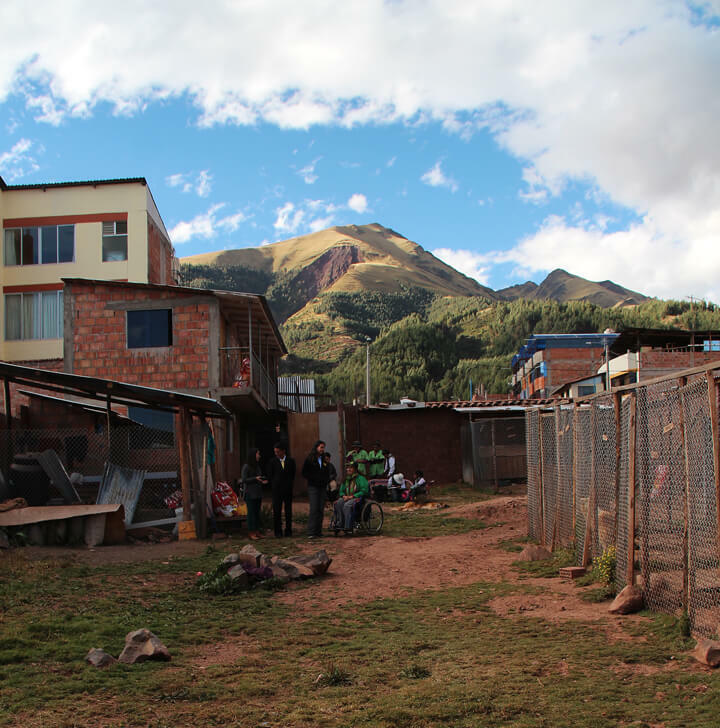 So, after two years, she found a property in Cusco that she rented and converted into a more suitable – though still underequipped – facility. For the next three years, this was where Pataz operated. However, the landlord raised Monica’s rent, and the shelter’s neighbors grew irritated with having such a facility in their midst. Monica had no choice but to move, which she’s continued to do each of the past three years, and for the same sad reasons: raised rents and cold-hearted neighbors. As of early June 2018, Monica is a month away from having to move Pataz yet again. During our visit, her situation is clearly fraught. Monica has not yet found a new place to move her animals. Her attention has been diverted of late. You see, there’s something else I should tell you about Monica. She’s currently wheelchair-bound, the result of a recent fall she took while carrying heavy bags of dog food to Pataz. While looking after her dogs, she’s also had to worry about her own health and wellbeing, which has sapped her of both energy and resources. 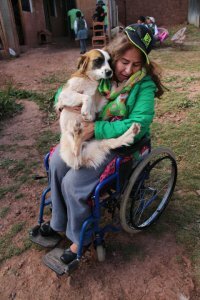 Yet, even this temporary disability isn’t stopping her from rescuing some of Cusco’s most desperate dogs. As she says this, her eyes and voice fill with heartbreak. 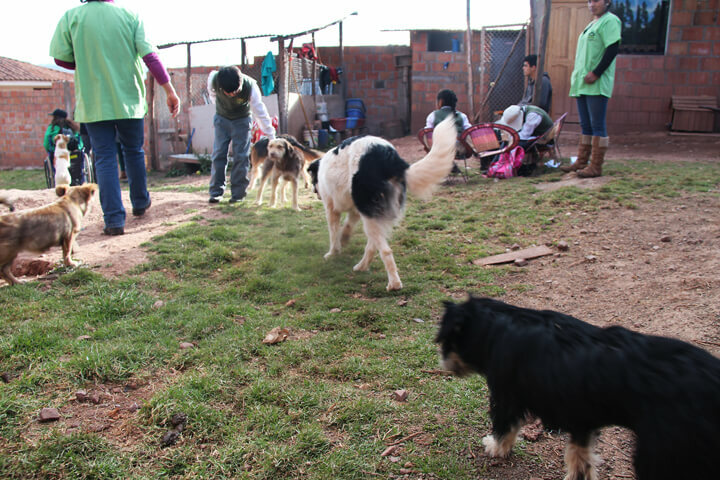 Monica and her small team do their best to find permanent, loving homes for the dogs, many of them full-grown, that find their way into Pataz, but it’s not easy. Rambo, a sweet, gentle dog with a gorgeous, golden coat, has been with Monica and Pataz for several years. He hopes to find a permanent loving home someday. 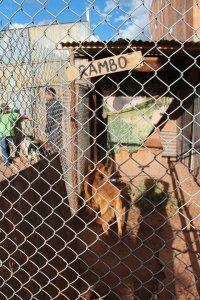 As long as Pataz and Monica are around, Rambo and the others currently in their care will always have a home. Other dogs aren’t so fortunate, though, because Pataz finds itself at just about capacity at the moment, given its meager financial situation. It’s a struggle for any charity to raise money, even here in America, but in a place like Peru, Monica’s is compounded. As we talk, an adorable mongrel begs to climb onto Monica’s lap. Monica points out a fresh scar on the dog’s under-side. “I just had this one sterilized, but I couldn’t pay the veterinarian,” she says, clearly embarrassed, through Layla. On top of all this, she has reshuffled her support base. Like in the United States, Peruvian charities, in order to be recognized officially by the government, must maintain a minimum number of members on their boards of directors. In Peru, that number is only three, but two of Monica’s founding board members recently tired of committing to her cause and informed her they were backing out of Pataz. They simply lacked her zeal for animal welfare. 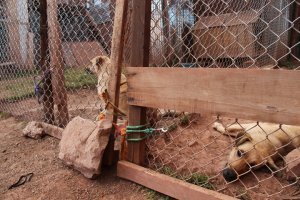 The dozens of dogs cared for by the wonderful folks at Pataz in Cusco, Peru are genuinely happy, as is evident to anyone who first walks through the metal doors of the facility. Thankfully, Monica has found two new people to take their place, so, Pataz will maintain its official charity status. And she has a handful of dedicated volunteers, including an energetic woman named Ursula, who greets us at the gates of the current Pataz sanctuary along with a swarm of at least a half-dozen enthusiastic dogs of all ages, sizes, and breeds. One of them, a small Jack Russell, leaps off his hind legs to plant a wet kiss on my nose. The others jockey for space under my arms to receive loving attention from a new face. I’ve come to Pataz with Layla and Mauricio, a colleague of hers and another animal welfare activist. He, too, has founded a nascent charity, Peru Animal Rescue. Mauricio has known Monica for several years and helped introduce Nutmeg to her. 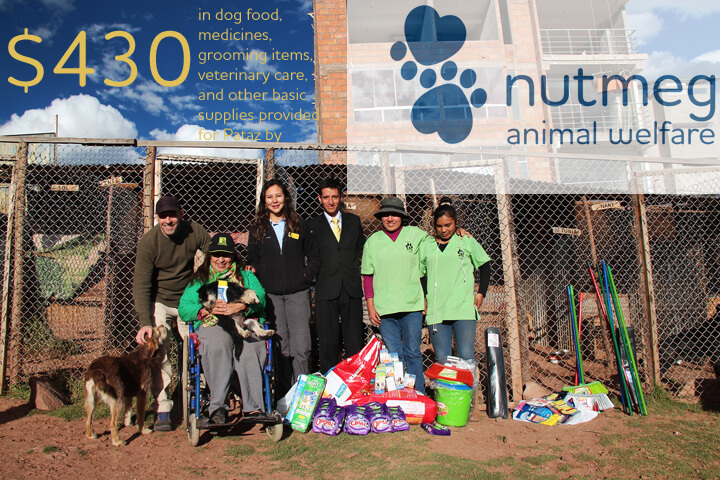 We’ve come bearing gifts: 700 Peruvian Nuevos Soles (approximately $215) in dog food, medicines, grooming products, and basic cleaning supplies for the shelter itself. After Monica shares her story, we decide to surprise her with an additional gift – doubling the original amount to pay the latest veterinary bills, bringing Nutmeg’s total contribution to $430. Monica estimates it costs her upwards of $5,000 (in U.S. dollars) per month to operate Pataz at its current levels. So, we’re thrilled to have helped defray at least some of those expenses for the time being. We have plans to keep in touch with Monica, through Layla and Mauricio, in hopes of doing more to assist her and Pataz in the future. We’ve already begun brainstorming, actually. 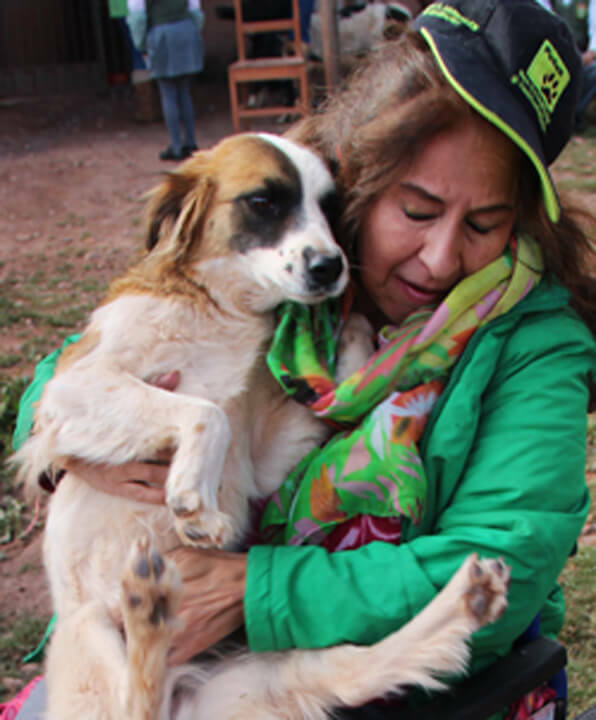 Meanwhile, Peru’s most distressed animals urgently need more people and organizations like these to secure the kind of future they all deserve. Which brings us back to the beginning of Monica’s story. 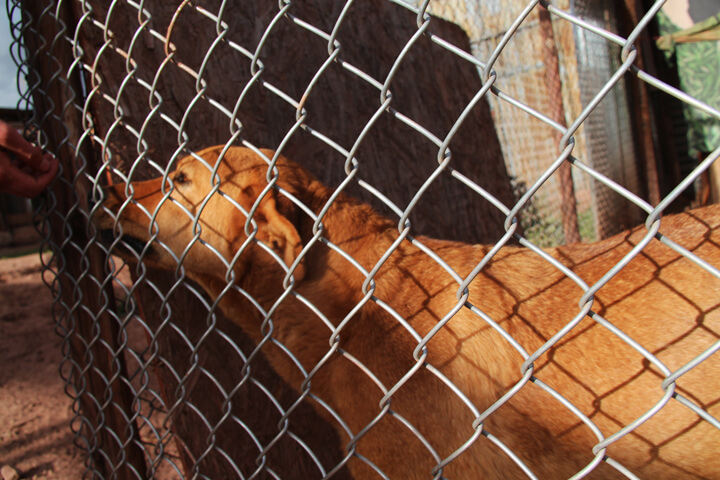 To help us continue to help Pataz in its important animal welfare mission in Peru, please consider a donation in any amount to Nutmeg today. 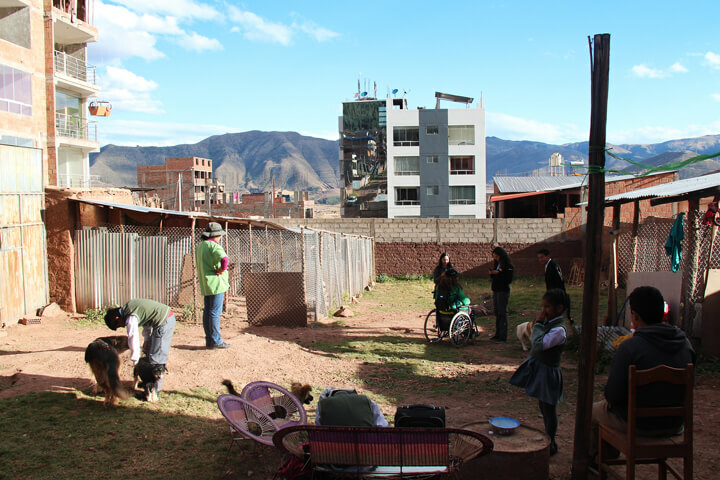 We will see that it gets used directly for materials and services to assist Monica and her team in Cusco right away. If you’d like to adopt Rambo or any one of her other dogs, please contact us and we will facilitate the process. Thank you.